I knew early in life I was destined for a career in art. At 16 years of age I attended the Queensland College of Art, completing a three year course in Commercial Illustration and going on to work as a graphic artist. In January 1982 after seeing a need in the industry, I opened Queensland’s first private graphic art college in Brisbane, then another campus on the Gold Coast in 1989. My college was called the Commercial Art Training Centre but later became known simply as CATC. With an impending relocation to America I sold the college in 1995 but it is still going strong today some 36+ years later. It is now the longest running private graphic art college in Australia with students employed in the advertising and graphic arts industry all over the world. After spending 20 years as a graphic artist/educator I began oil painting classes. This brought about a whole new direction in my artistic life, so when I arrived with my family in USA in 1997, having discovered a love for painting I promptly enrolled in classes at the local community college. My first solo exhibition was in Newport Beach, California six months later. It consisted of the 27 oil paintings completed during the time I spent in America. Since returning to Australia in 1998 I have held solo and group exhibitions in Sydney, Melbourne, Mildura, Merimbula, Canberra and Hamilton Island – Queensland, where I was also invited to teach art classes to guests and staff at the resort. 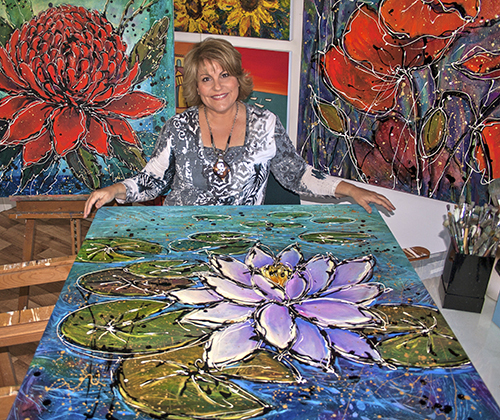 I established my studio gallery – Boardwalkart in Merimbula in 2002 and continued to paint and exhibit in solo, joint and group shows on the Far South Coast and interstate. 2013 saw Graeme Stevenson from ‘Put Some Colour in Your Life’ inviting me to feature on his international television program. It was a wonderful opportunity to show my art to the world adn inspire others to get creative with paint. You can view the video on my home page or click HERE. In 2014 after my children who had now grown up and left home, I decided to travel through Europe and settle in Canberra for 3 years. 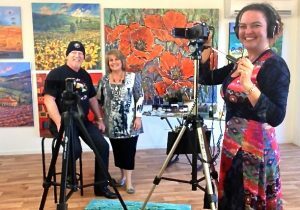 I am now back on the beautiful Sapphire Coast, painting, exhibiting and teaching art classes and workshops. When painting I draw on my own personal experiences – spiritual, emotional and physical. Each piece is influenced by that experience, albeit the use of colour, texture, form, design or some other intrinsic elements. Whilst I work mostly in oils and acrylic, I have in more recent years introduced fibre/ textiles into my paintings which has seen the immersion of myself in what seems to be ‘endless’ possibilities of mixed media. I don’t purposefully set out to paint anything in particular but rather allow the painting process to take me on an exquisite journey. That journey may be guided by my mood or my desire to capture a moment in time, a feeling or perhaps a place I have visited. Moulding myself into my artwork, finding myself one with the paint, I intuitively choose each element, freeing my mind of all thoughts other than where the painting dares me to go. It is with unabashed excitement I view the blank canvas before me and with great gusto I launch myself into the unknown. s sixteen attending my first day at art college. I expect the coming decade to reveal new works with strong imagery and design, drawing on my cultural, life and travel experiences to create ever-changing works of art that reflects to the viewer a sense of mystery, wonder and beauty. Influences: My beloved grandmother – Olive Howell who lived with my family since the time of my birth. Throughout my childhood and teenage years I watched her paint, until she was 83 years of age and near blind with cataract. It was she who introduced me oil paint and watercolour, and to the works of Tom Roberts, Arthur Streeton, Frederick McCubbin and Hans Heysen, whose paintings are indelibly etched on my mind.